The city of Duarte in Los Angeles County, California is situated to the south of the beautiful San Gabriel Mountains and offers culture, nature, and industry to its ever-growing population. The recent growth in the industry to the area has brought businesses and their families to Duarte. Families can enjoy the wide assortment of parks including Bassett Park and Encanto Park as well as hiking in the nearby Fish Canyon Falls. There are also shopping malls and fine dining as well as assorted museums and cultural events. Most importantly, the growth has allowed for residential developments to spring up across the city as most people are living in HOA and multiple-family housing. Managing a multiple-family development or HOA complex is no easy task and when it comes to roofing, you need to be prepared to keep things up to code and safe as well as attractive. Weather and wear and tear can take their toll on roofing, so the better you watch over the building, the better able you will be to catch problems before they get out of hand. Having the right roofing company to work with also makes this less challenging. When it comes to HOA housing and roofing, it is essential to remember that you are dealing with more than one tenant and more than one individual’s needs. There is a variety of possible roofing issues and a wide customer base. You want a roofing company with experience in working with HOA developments, HOA boards as well as apartment managers. Different skills and expertise is required for these projects. We can work with you on any of your HOA and residential roofing projects whether it is apartments or condos. We have experience with all roofing types and designs and can provide the best quality service. Whether a new roof needs to be installed, water damage repaired or shingles replaced, we have the tools and knowledge to get this done efficiently and quickly. We understand that you cannot have disruptive construction for a long period of time so work quickly so as not to intrude on the lives of your tenants. 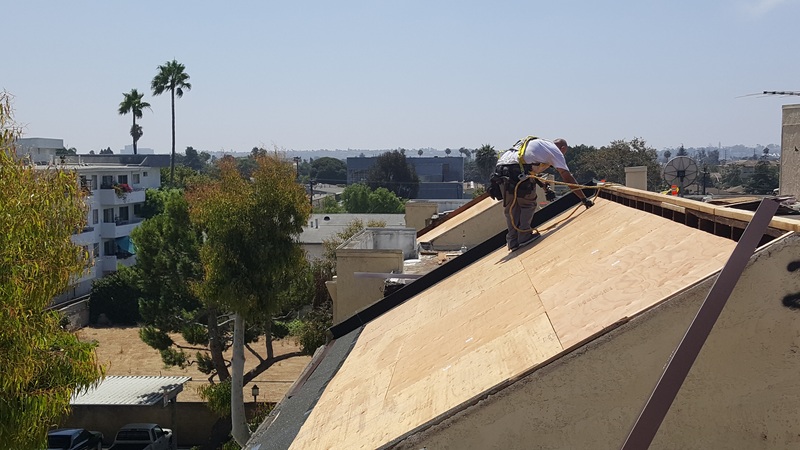 We understand that some roofing projects are more complex while others are simple repairs; regardless of the need, we can guarantee quality service at pricing for all budgets. Every job, big or small, is treated as a priority and we provide full service from repair, installation and follow up maintenance and checks. Whether you have shingles, metal roofing, slate, clay, low sloping or flat roofing, we can cover it all. We have experience with a variety of roofing styles so can assure you the best work. So call us today to take care of your HOA roofing needs, we can get started with a full inspection to let you know where you stand.